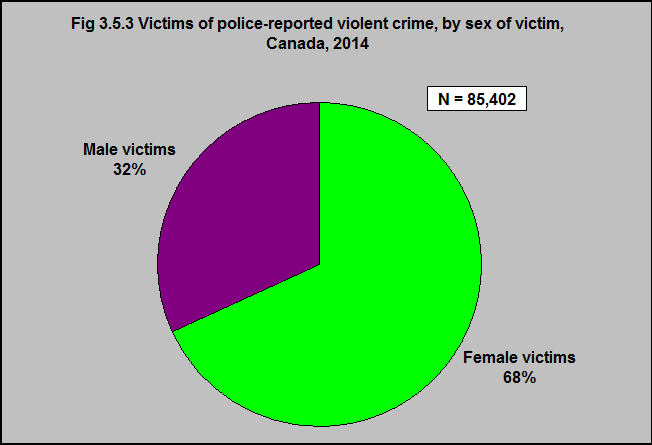 Source: CICH graphic created using data adapted from Statistics Canada. Family Violence in Canada: A Statistical Profile, 2014. http://www.statcan.gc.ca/pub/85-002-x/2016001/article/14303/02-eng.htm -accessed July 26, 2017. In 2014, there were over 85,000 police reported violent crimes where the victims were assaulted by a family member – either a spouse, a parent, a child, a sibling or another immediate or extended family member. 68% of victims were women (57,835) and 32% were men (27,567). Over one quarter (26%) of all victims of police-reported violent crime were for family violence.